Construction of the $150 million Brisbane Airport Hotels and Conference Centre commenced today. Setting a new benchmark as the biggest external development venture and first 5-star hotel for Brisbane Airport, the $150 million development will create an estimated 1,000 jobs during construction and a further 300 to 350 jobs once open. 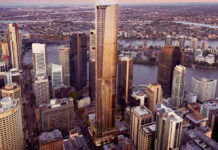 Lord Mayor Graham Quirk said the development signified growing confidence in Brisbane’s visitor economy, not only for leisure and events travellers but also for business travellers, and represented an important new offering for Brisbane. “Last year the Guide to Hotel Investment in Brisbane highlighted that a shortage in internationally-recognised, full-service hotel rooms was causing Brisbane to forgo 121,000 visitors a year, and was hampering Brisbane’s ability to attract major events and conferences,” Cr Quirk said. Joint owner and developer, Scott Flynn Managing Director of Scott Flynn Properties, welcomed the start of construction by Watpac Limited as it moves them a step closer to delivering one of Brisbane’s most unique and competitive hotel and conference venues. “This is an exciting development opportunity, and not just for us as owners, but for the airport and for Brisbane. There’s nothing like it here in Brisbane. We’re confident its combined facilities and unbeatable airport location will make this venue a major player in the hotel and conference market when it opens in September 2017,” Mr Flynn said. Julieanne Alroe, Brisbane Airport Corporation CEO and Managing Director said, “The construction of these hotels and conference centre in the heart of Brisbane Airport’s busy Domestic Terminal is an indication of the strong future passenger growth we expect. “With this growth in mind, it is essential as a preferred gateway to Australia that the construction of quality new facilities in Brisbane continues so we can support the visitors who, will in turn, support the economic and cultural growth of Brisbane and Queensland. “I’d like to congratulate the Flynns on today’s ground breaking and their enterprise and drive and thank them for their continued support of Brisbane Airport and the future of Brisbane,” Ms Alroe said. “The development’s contemporary design by Noel Robinson Architects has been created to respond to the emerging needs of executive and leisure travellers in a way that fosters business and pleasure in equal measure,” Mr Flynn said. The development is the Flynn brothers’ second hotel investment at Brisbane Airport. Their first, the award-winning 4.5-star Novotel Brisbane Airport at Skygate, opened in 2009 and has experienced six years of solid trading and occupancy, including hosting close to 400,000 hotel guests.